It can be frustrating to realize that you are finally making a decent salary and you still find yourself struggling to make ends meet every month, even a small emergency may send your finances into a tailspin. As you get older and start a family, your expenses will naturally go up. This can affect how far your paycheck can actually stretch. There are a few things that you may want to consider to see where your money is going. Finding the problem can help you create a plan to get control of your money. Are You House Poor? : You may have decided it was time to buy a house when you finally got a raise, or to move to a nicer apartment. This may be affecting your overall budget, more than you realize. When you are house poor, too much of your income is going toward your house payment. Is your house payment more than twenty-five percent of your pay? If it is, you are likely struggling to save and meet your other expenses. You need to consider if you are willing to make the sacrifices necessary to keep your home. This may mean barely making ends meet while you work on bringing down the equity so you can refinance to a more affordable payment or until you get a significant raise. If it is too much, you may need to sell and buy something more affordable. Do You Have Too Much Debt? : Another issue may be the amount of debt that you are carrying. You should consider both your debt-to-income ratio, as well as the amount you are paying in debt payments each month. This debt should include your credit cards, personal loans, car payments, and student loans. 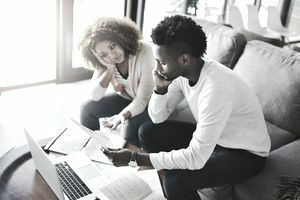 If you are paying more than thirty percent of your income toward debt each month, you are in danger of defaulting, and it can seriously affect the rest of your budget. In this situation, you need to work quickly to bring the payments down and to get out of debt as quickly as possible. It may mean drastically cutting your lifestyle or taking on a second job to get things under control. Do You Have Spending Issues? : When you look at things on paper, everything works out. You have enough to cover your basic needs, and money left over to buy some of the things you want. But somehow in the middle of the month, you are left with no money at all. You struggle at the end of the month to put food on the table and cover other expenses. If this is happening to you, it is likely that you have spending issues, and you may need to try switching to cash for everything but your bills. This can help you to realize when you have spent the money that you have available to you. Do You Have a Budget? : Another issue may be that you do not have a budget to follow each month. A budget is more than a written list of bills that you pay. It is a plan that gives your money purpose. It gives you the power to decide how, when and where you spend your money. It's like having a fitness tracker for your finances. If you think you make enough to cover everything, but you have never written down a budget then you may not even be able to tell what your problem actually is. Take the time today to write down a budget, and see where your money is actually going. Once you have written it down, you will need to track your expenses and stop spending when you have reached your limits. Are You Having the Right Amount Withheld? : Another thing to take into consideration is whether or not you are having the right amount withheld when you file your taxes. If you have a mortgage or if you have children, you may be able to claim more and get more money with each paycheck. An easy way to check your withholdings is by using the IRS withholdings calculator. You should do this when your income or spending situation changes. Take the Time to Change Your Situation Today: You can turn around your financial situation. It will take work, but it will be worth it. Your first step is to set up your budget. This will help you diagnose your problem. From there you can create a plan to get out of debt. You may need to make more money, at least while you clean up any debt issues that you may have. After that, an emergency fund can help make budgeting easier and will help you cover the unexpected expenses that may come your way. Eventually, you will want to save up to a year’s worth of expenses. Then you can be comfortable and ready to handle any emergency that comes your way. As you do this take time to remember what you learned about money management as you changed your financial situation.